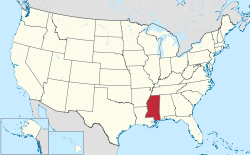 Mississippi  is a state in the South of the United States of America. Most of its western border (with Arkansas and Louisiana) is the mighty Mississippi River. Tennessee lies to the north and Alabama to the east, and it has a small coastline on the Gulf of Mexico to the south. Natchez Trace Parkway - This 444 mile long parkway is administered by the National Park Service and follows a route from Natchez to Nashville that dates back hundreds of years. Hiking, Indian mounds, natural history exhibits, and interpretive exhibits make this is leisurely and enjoyable route for motorists. Mississippi is often overlooked by travelers, yet those who seek out the many things the state has to offer will not regret it. Mississippi is the home to the blues, an unrivaled literary tradition, and incredible food. Visit Mississippi to experience rich history and warm hospitality. The southern part state was significantly affected by Hurricane Katrina in August 2005, particularly the Gulf Coast. While rebuilding continues in some of the worst damaged areas, open visitor facilities are again abundant. Interstate 20 (east-west route along the lower middle half of the state), I-10 (again, an east-west route along the Gulf Coast), I-55 (north-south route passing through the middle of the state), and I-59 (southeastern corner of the state). Highway 61 in known as the river highway. It goes through cities like Port Gibson, Vicksburg, and Natchez. Jackson has the largest airport in the state, Jackson-Evers International Airport (JAN). The Gulfport-Biloxi International Airport is also of an adequate size. Smaller airports are found in Columbus (Golden Triangle Regional Airport), Greenville, Hattiesburg (Pine Belt Regional), Natchez, and Tupelo. Travelers to Mississippi also very commonly use one of two nearby, large international airports: Memphis International Airport in Memphis, TN, or Birmingham International Airport in Birmingham, AL. See Amtrak for the most current and active routes (several routes have permanently closed due to Hurricane Katrina or waning customer interest). Greyhound Bus Lines (or the Delta Bus Lines for most routes within Mississippi) offers service to several cities in Mississippi; however, check Greyhound Bus Lines' webpage  to see the cities currently that are serviced in the state. Be aware that there are several cities in Mississippi that has very limited service, so there is typically not a ticketing agent, service center, or even a enclosed bus stop. You may be just at the side of a highway of such a city. The following cities that have limited bus service in Mississippi are: Batesville, Belzoni, Itta Bena, Lorman, Mount Olive, Pascagoula, Tunica, and Winona. The easiest method of getting around Mississippi is by automobile (and, in most cases, it’s the only method of getting around the state). You can travel around Mississippi by using the Greyhound Bus lines , but it is a very inconvenient method of traveling around the state. If you do decide to travel by bus, be prepared for long waits, uncomfortable rides to remote locations (typically the bus stops are at a gas station on the outskirts of the city) and unannounced bus route cancellations. The hassle of visiting the state by bus is not worth the money you save compared to renting a car; sometimes, you may have to rent a car anyway due to the limited bus routes. Visitors to Mississippi should seriously consider renting a car (usually, most auto rental locations are at airports: just be sure to make reservations far in advance), as there is not a well-established public transportation system in this state. Be prepared to seek alternate transportation if you do not have the following: a valid driver's license accepted by the United States, be at least 25 years in age (some rental companies may allow 21 year old adults to rent their vehicles), and a major credit card issued by such companies as: Visa, Diner's Club, American Express, Discover Card, or MasterCard. The lack of such items or being 25 or less will make renting a car very difficult, if not impossible. Note - It may be very difficult, but it is not impossible to rent a car with a debit card (with the Visa or MasterCard logo) if you lack a credit card. Rental companies such as Enterprise, Alamo (Enterprise and Alamo's rental restrictions to non-credit card payers typically makes it much more of a hassle to rent from than from other rental agencies), Thrifty, Rent-a-wreck (typically RAW is the easiest company to rent from without a credit card), and Budget car rental will usually rent to customers without a major credit card; however, expect far more restrictions (and hassles) with their rental terms. Do your research first before exploring this option, and expect to have to speak with a manager rather than the front-line customer service representative you encounter to make any progress. The legal driving age in Mississippi is 15 on a learners permit, 16 on a restricted license, and 16 and 6 months on a unrestricted license. Anyone with a learners permit can drive between the hours of 10 a.m. to 6 p.m.
Mississippi has four major interstate highways. I-55 runs North-South from New Orleans, McComb, to Memphis and runs through the state capitol of Jackson. I-20 runs East-West from Vicksburg to Meridian and crosses I-55 in Jackson. I-59 cuts across the southeast corner of the state connecting New Orleans to I-20 just west of Meridian. I-59 and I-20 merge into one interstate at that point and head east until they split in Birmingham, AL. I-10 runs the length of the Mississippi Gulf Coast. There are several interstate spurs and loops in Mississippi, the two of note are I-220 connecting I-20 to I-55 around the northwest perimeter of Jackson and I-110 connecting I-10 to US-90 (aka Beach Blvd) in Biloxi. Interstate speed limits are mostly 70 miles per hour in rural areas, and 60 mph in urban areas. State highways with 4 or more lanes are usually 65 miles per hour and slow down by 10 mph increments when they enter developed areas (usually no lower than 45 mph). Typically, two-lane highways have a speed limit of 55 mph in rural areas. Like any other state, Mississippi has a mixture of four-lane divided highways and two-lane rural highways and state routes. However, Mississippi does provide a respectable number of multi-lane highways. Highway 49 is a 4-lane highway that connects the Gulf Coast to Jackson and crosses the Mississippi River at Helena. Highway 98 connects I-55 and I-59 across the lower half of the state. Highway 25 (state route) connects Jackson to Starkville (Mississippi State University). Highway 82 runs east-west in the upper half of the state. Pay attention to your maps and ask the workers on duty at the state welcome centers for help. You might find a shorter route than if you stay on the interstates. Most on-line mapping services assume the worst about state highways when compared to interstates. Get off the road and enjoy slower pace. Highway 51 runs parallel to I-55 through the state. Except in urban areas, US 51 is a fairly scenic route. The Natchez Trace Parkway is also a scenic option and is operated by the National Park Service. Just obey the speed limits. US 80 parallels I-20 across the state, but makes for a more interesting drive by taking you through towns that were bypassed. US 90, also known as Beach Blvd, is about as far south you can get in MS. US 90 along the coast line between St Louis Bay and the Back Bay of Biloxi. Be aware that when refueling your car that if you intend to use your credit card (particularly credit card accounts issued from banks outside of the US), you may experience problems using the self-serve stations. Most self-serve gas stations may require the purchaser to input their home ZIP code (a five-digit mail routing address used in the US) as a means of identifying the purchaser, as smart credit cards are not widely used in the US. Also be aware that there are very few full-service gas stations in America (where a gas station attendant fuels the car for you), but you may find a few in the much smaller areas in Mississippi. You can travel by Amtrak on along the following routes: the center of the state (north / south route), the southeastern corner of the state, and along the Gulf coast. If you have plenty of time and you are not in a hurry to get to your final destination, this might be an interesting way to visit the state. The main disadvantages of rail travel in Mississippi are that there are only a few stations that are still in use, sometimes travel times may be long, and the routes are limited so you cannot explore the state very well. City of New Orleans (Chicago - New Orleans): McComb, Brookhaven, Jackson, Yazoo City, and Greenwood. Sunset Limited ([Orlando -] New Orleans - Los Angeles): All service east of New Orleans suspended. Crescent (New York - Atlanta - New Orleans): Hattiesburg and Meridian. The Civil War Park in Vicksburg is interesting to visit, and the entire park can easily be visited in a day using either a car or by bicycle. The cost is $8 US to enter, and it's a bargain. Be sure to allow yourself at least 2 to 3 hours for the Cairo battleship exhibit alone. Tourist pamphlets in multiple languages (Spanish, German, French, and Japanese) are available at the Cairo exhibit. Mississippi is the home of the blues, and the Blues Museum in Clarksdale is interesting for the blues music enthusiast. In addition, live blues is still fairly easy to find in the Delta and in Jackson (where the former Subway Lounge blues bands play on Saturday nights at Schimmel's Restaurant). Although B.B. King was born in Itta Bena, the city of Indianola will have a B.B. King Homecoming Festival on the first week of June every year at Fletcher Park. Children under 12 are free from paying admission to the event. Be sure to visit the antebellum houses in city of Natchez. The tours offered during the pilgrimages are a good way to see a wide selection of the houses and buildings. Also in mid October Natchez has The Great Mississippi River Balloon Races. This event is a three day weekend of races, food, and music. Bring a blanket or chairs for the music fest. For those who enjoy nature, a journey along the Natchez Trace Parkway (which starts in Natchez, MS, and ends in Nashville, TN) is a good bet. Be aware that the speed limit is strictly enforced (by the US Park Police) at 50 mph (80 km/h), and that wild animals such as deer and turkeys will often run across the road suddenly. Also keep in mind that you will have to share the road with bicyclist and those camping along the Natchez Trace. Also, the roadway does not have streetlights, so it is very dark at night: so beware. No commercial vehicles are allowed on the Natchez Trace, so the traffic is light and easy-going. The International Ballet Competition takes place once every four years in Jackson. The competition takes place at Thalia Mara Hall in downtown Jackson on Pearl Street, and some of the best ballet dancers from around the world come to Jackson to compete 1-601-355-9853 (157 E Pearl St). Although many people tend to skip Mississippi as a tourist destination and many Missisaippians see gambling as immoral and don't attend casino nights, Mississippi has a major gambling industry, one of the largest in the United States. As with Nevada, gambling establishments range from Huge Casinos to boasting slot machines, table games and sports books to small bars and convenience stores with a few video poker games apiece. Tunica is the mecca center for gambling in the South. Many from nearby places such as Memphis visit due to the short driving distances. There are other smaller gambling destinations in the state, such as Bay St. Louis, Gulfport, Biloxi, Philadelphia (Choctaw Indian Reservation) to name a few. Keep in mind as with Las Vegas, strict restrictions are placed upon casinos concerning where minors may be present within a casino and these rules are harshly enforced. State law requires that you must be 21 years of age to gamble and have a valid government issued ID to enter a casino (a government issued ID with your picture that is written in English, such as a passport (which is strongly recommended for foreign nationals) or a driver's license), otherwise, you will be refused entry into the casino. Expect to have your ID checked upon entry (and sometimes rechecked while you are in the casino too: if you have a youthful appearance) as most casinos are so cautious, almost to the point of being paranoid, in their efforts in preventing underage patrons from sneaking into their establishments. Outdoor activities are a favorite of Mississippians, given the state's low population density and natural resources. Hunting, fishing, water sports, camping, and hiking all have their devotees. Take tours through antebellum mansions. There are horse-drawn carriage tours in Natchez. The larger cities and towns in Mississippi provide major retail stores. Some major malls in Mississippi include Barnes Crossing Mall in Tupelo, Northpark Mall in Ridgeland (Jackson Metro area), Dogwood Festival Market in Flowood (Jackson Metro area), Turtle Creek Mall in Hattiesburg, and Edgewater Mall in Biloxi. Other great shopping malls that you would find very interesting and good clothes is the Edgewood Mall in McComb, and the Bonita Lakes Mall in Meridian. Most smaller towns still offer your typical nationwide and regional stores, but local antique and furniture stores abound. If you go looking for antiques, you will likely find one near the old town centers. Natchez has Franklin st., which is known as "antiques row". Canton, located north of Jackson on I-55, is well known for its biannual flea market, and antique stores surrounding its historic town square. Canton is also the county seat of Madison County. The flea market is held each May and October. The state is largely rural. Outside of large towns and away from major interstates and state highways, dining options are fairly limited, but even the smallest of towns will have a local diner. However, if you enjoy country cooking, there is no shortage of good to excellent places to eat. Fried chicken, country-fried steak, fresh vegetables, and cornbread are favorites, although barbecue is also fairly widely available. Mississippi barbecue tends to pork ribs and pulled pork or chopped beef sandwiches with tomato-based sauces, usually slightly sweet. Fried catfish is one meal that Mississippians pride themselves on. If you want to visit the world catfish festival  go to Belzoni (pronounced by the locals as: bell-zone-uh). There's not much to see there, but it's interesting if you're in that area. One treat often served with catfish is fried dill pickles, a strange sounding but delicious side dish. Generally, one can't go wrong with Mississippi staples of biscuits, corn bread, fried chicken or steak, collards and other greens, and fresh vegetables. In Indianola, you can visit the Indianola Pecan House  where you won't find a shortage of ways to consume pecans, which are found in abundance in the local area. Laws regarding alcohol are a frequent source of confusion to outsiders. Mississippi continues to practice "local option" with regard to sale of alcohol. Under this system, local jurisdictions may choose whether or not to allow the sale or consumption of alcohol. Beer, where sold, may be purchased from convenience stores or supermarkets, while wine and spirits may only be purchased from licensed liquor stores. Alcohol-by-the-drink is yet another area of local option; some permit purchase of alcoholic beverages at restaurants but do not permit liquor stores. Where they are allowed, liquor stores are limited to the hours of 10am-10pm; hours during which beer sales are permitted are at the discretion of the county or municipality. The only reliable way to determine the regulations is to ask a local. Do note that there are still numerous counties where alcohol is forbidden; enforcement is typically lax regarding alcohol purchased elsewhere for personal consumption, but may not be if an officer of the law decides to make it an issue. Try Lazy Magnolia beer,  brewed in Kiln, MS. Its most popular brew is Southern Pecan Ale. Lazy Magnlia beers can be found on tap in many bars and restaurants throughout the state. 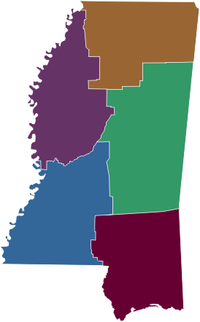 Be aware that some counties in Mississippi are 'dry counties', that means sale of alcohol is either prohibited or restricted. Currently, 24 counties are completely dry. When driving at night, keep in mind that most highway roads and even a majority of the Interstate routes in Mississippi do not have lights posted on the sides of the roads, making the roads very dark at night. This can sometimes make driving a little more challenging, as you have to always anticipate wild animals (and sometimes wild drivers) darting out in front of you at a moments notice. Be aware that during the winter season when it gets dark, that it is not uncommon to have wild deer stray across roads with oncoming traffic, only to have motorist crash directly into them as there is rarely any time to avoid the deer. Beware of the hunting seasons if you intend to trek in some of the wooded areas of the state. It is common to learn of a hunting accident where a victim was accidentally shot and killed by a hunter. If you do intend to trek the wooded areas during hunting season, use caution and always wear a bright "hunters" orange vest, so other hunters will not mistake you for wild game. Considering the risk of personal injury, it would be wise to avoid the some of the wooded areas (especially during deer season - for usage of firearms it is typically from mid November till mid December). Don't assume that just because a land owner who has posted their land as being off-limits for hunting, that determined hunters will abide by the rules. Occasionally you might encounter a panhandler (a beggar) in a casino parking lot asking for a handout (asking to "borrow" (begging for) $5-10), or claiming to want to sell you something for a huge bargain. Do not engage this person, and immediately walk away without saying anything. It might be wise to alert the casino's security personnel of the event as most casinos in Mississippi are active in removing panhandlers and nuisances from their property quickly (as they do not want to acquire a reputation of having their customers being harassed by panhandlers). One should be sensitive to the fact that most of the people within the state are both very socially and religiously conservative, and have little tolerance for public drunkenness or public displays of homosexual affection between partners. In most cities within Mississippi public drunkenness can get you up to 90 days in the city/county jail, in addition to a $1000 penalty. In terms of race relations, much has changed for the better since the 1950s and 1960s; however, that is not to say that there are not still remnants of racism within the state. Individuals should be aware they may encounter ignorant behavior for no apparent reason, regardless of race. This type of ill-bred mannerism is typically found in the more rural sections of the state, where tourists usually do not visit or stay for extended periods of time. It is also noted that younger Mississippians are generally more tolerant of people of different racial backgrounds than their seniors. Being a part of the gulf coast, the state is prone to experiencing hurricanes. Some of the worst hurricanes (such as Hurricanes Camille and Katrina) have caused wide spread devastation, which have taken years to overcome. Whenever you hear in the news of a hurricane watch (conditions are favorable for a hurricane to strike land within 36 hours and you should plan to evacuate) or a warning (a hurricane strike is enviable within 24 hours and you should seek shelter immediately), do take them seriously and take appropriate precautions. Mississippi is located within a region that is known for experiencing tornadoes during the early spring and summer months. It is a good idea to maintain an awareness of current weather conditions during your travel to or through the state during these seasons to remain vigilant of any potentially dangerous weather situations. These conditions change very quickly, and if the forecast calls for severe storms, be sure to update yourself regularly throughout the day. Refer to the Tornado safety page if you are planning to visiting Mississippi during the spring/summer months. During the warmer months of the year, consider using mosquito repellent with a high DEET concentration, as taking such precautions can reduce the opportunity of becoming infected with diseases normally transmitted by mosquitoes. In the Delta region of the state, mosquitoes are absolutely terrible during the warmer months of the year, making wearing mosquito replant an absolute must. Occasionally throughout the year, you'll read or hear about boil water alerts (usually as a result of a water treatment center that had lost its water pressure for one reason or another). Although it is safe to shower and bathe with the water, it is not advisable to cook, drink, or brush your teeth using untreated tap water during an alert notice. Check the with the Mississippi State department of Health for current notice alerts . During the summer months, the humidity and high temperatures can be very intense for those who have never lived in hot muggy environments before. Be sure to drink adequate amounts of water or sport drinks (such as Gatorade) if you are going to work or play outdoors during the summer. The larger cities in Mississippi have sufficient levels of hospital care that can handle most serious and critical illnesses or life-threatening injuries (IE world class medical care). Most of the smaller cities (usually those with populations of at least a few thousand citizens) have a nearby county hospital, which is sufficient for minor non-life threatening injuries or illnesses, but you may have to be transported via medical helicopter to the larger regional medical facilities (sometimes out of state if necessary) if you are facing a critical injury or illness when time is of the utmost of the essence. Smaller cities of less than a few thousand people in population generally do not have a hospital, and you will have to travel to the nearest county hospital for care. Be aware there is not a national health care system, and you are expected to be fully insured to pay for all medical services rendered. Otherwise, expect a huge medical bill that you will be expected to pay in full upon your discharge from the hospital (which can very easily run into the thousands of dollars for even minor emergency medical care). An alternative to the emergency room (typically in the larger cities in Mississippi) for non-life threatening care only and minor illnesses are "urgent care clinics." An appointment is not required, but you can expect to wait for sometimes an hour or two before seeing the doctor. Again, you must be insured for medical treatment, or expect a moderately high bill (not nearly as expensive as an emergency room visit, but its still not inexpensive either). Hours of operation vary, but generally are open from noon till 6 PM, and are usually closed on weekends. When checking in for services and you do not have insurance but you do have the means to pay, be sure to let the receptionist know, or you may be subjected to expensive tests which are not needed. Being that the state is very socially and religiously conservative, it is wise to not make jokes about the predominant Christian religion practiced in the South, the Baptist denomination. You may be asked by people whom you've only met once what religion you practice. To most Mississippians, this isn't considered a personal question to ask another individual. If you feel this is too personal of a question to respond to, you might reply that you are not comfortable discussing such a personal matter outside of your family and religious network. You may also be asked to attend one's church, and if you are inclined to do so, men should be sure to wear a respectable, yet conservative, suit and tie, or a conservative dress for women. You are not obligated to attend one's church if you do not feel comfortable doing so, but be sure to be very tactful when declining an invitation. The state flag of Mississippi contains the Confederate battle flag in its upper left corner. To many people this is an extremely emotional and sensitive image (on both sides of the political spectrum). It is wise as an outsider of the state to avoid the discussion of the state flag (either positively or negatively) to avoid attracting unwanted attention. As in other Southern States, when addressing people you have met for the first time (particularly those who are older than you) be sure to say either "Yes, sir / No, sir" or "Yes, ma'am / No, ma'am", in much the same manner that a soldier in the military would address a superior officer. Do not use first names until the other person uses yours, as it is considered rude to do as such without permission. Be aware that many Mississippians have or are enlisted into the US military, or have relatives who are active or reserve members of either the US Military, or the Mississippi National Guard. Pride and respect is very strong for members of the military and the economic support that the military provides to Mississippi. Never make jokes or derogatory statements about the military, especially of its servicemen and servicewomen. Singing songs and making jokes about Mississippi's past racial inequalities (or the past of any Southern state) will not get you friends and will cause backlash. Mississippi and its neighbors are remorseful for their past injustices so bringing it up will cause emotional responses within Mississippians. Cell phone coverage in Mississippi is generally better (especially with Sprint's & T-Mobile's networks) along the major Interstate routes. Coverage in the southern Mississippi region is sometimes spotty (particularly west of Hattiesburg). 4G coverage though growing sporadically throughout the state near the college cities, generally is located in the Jackson metropolitan area; however, outside of the Jackson area, 3G service is typically available with parts of the Delta being the exception. Check with your cell phone provider for coverage maps. The regional cell phone provider C Spire Wireless has a large network established throughout Mississippi, and you might be able to roam on their towers if you are not a customer. Consider purchasing a disposable cell phone from any major electronic department store in Mississippi during your visit. There are few fee pay telephones available outside of airports or shopping malls. The cost is about $25 a month is the average price for approximately 100 minutes of talk time without (in other words, its very expensive for what you pay for). In the event of an emergency, you can dial 911 (for police, fire, and medical assistance) from any cell phone or landline free of charge. If you use a cellphone, it is important to let the operator know exactly where you are located at, as it takes time to find out your location if you do not give that information (time that you should not waste). For non-emergency calls, do not dial 911, but rather contact the specific organization directly from their non-emergency phone number listed in the respective local phone book. The Mississippi Highway Patrol may be contacted (in the state) on your cell phone by dialing *HP (*47). Note that this is only for emergency calls on the highways or Interstate routes from cell phones only. There are no foreign consulates with citizen services within the state of Mississippi, only a few honorary consulates serving business functions. In the event you require the assistance of your government (loss of a passport, arrest, etc), larger countries may have consulates in the much larger metropolitan cities outside of Mississippi (cities such as Atlanta GA, New Orleans LA, Houston TX, Dallas TX, and Memphis TN). Refer your specific countries' consular web page to learn where they are located in the southern part of the US. Alabama - East of Mississippi is Alabama, where Mobile is a historic port city and Gulf Shores is a popular resort. Tennessee - Located to the north of Mississippi, Tennessee offers the cities of Memphis, Nashville, Knoxville, & Chattanooga, plus the beautiful Great Smoky Mountains. Arkansas - Mississippi's northwestern neighbor, "The Natural State", is home to the Ozark Mountains in the northwest while the south and east of the state has flatter land and shows more of its agricultural heritage. Louisiana - Home to New Orleans, this state on Mississippi's western border offers a unique culture. This page was last edited on 22 July 2018, at 01:27.